Mitchell Fine Art launches its 2019 exhibition calendar with a group exhibition, ‘Director’s Choice’. Showing from 30th January the exhibition is curated primarily from the gallery’s collection. A highlight of this year’s exhibition is the focus on two artists—Ann Thomson and Peter Hudson. Whilst Peter has exhibited at the gallery in the past, this will be the first showing of Ann’s works. Both are Queensland artists although Ann now resides in Sydney. 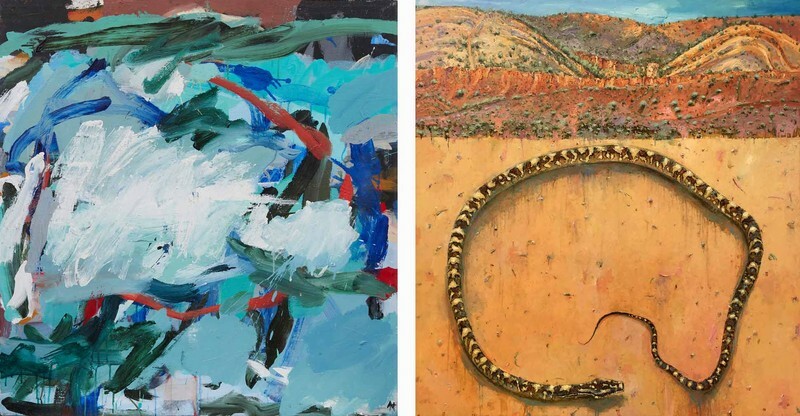 Together these two artists explore the duality of Australia’s landscape. Ann Thomson’s paintings are a result of two residencies in 2017, one on Magnetic Island and the other in France. Ann has created a suite of exquisite watercolours on paper that look at our coastal lifestyle. They are small works but beautifully engaging. The works on paper are complimented by several larger oil paintings of the same theme. Whilst painted in France they are of Australian seascapes. In a complete contrast Peter Hudson has produced a body of work that concentrates on Australia’s vast interior and our incredible night skies. From outback Queensland to Central Australia the works are panoramic and breathtaking. People travel from around the world to view our night sky. These works are his homage to our natural treasures. The contrast between the two bodies of work is a wonderful fit. Artists also featured in this year’s edition include: Abie Loy Kemarre, Angelina Ngale, Kudditji Kngwarreye, Margaret Loy Pula, Mirra Whale and Stewart MacFarlane. Official opening celebrations will be held at the gallery on Saturday 2nd February from 2pm, with artists Ann Thomson and Peter Hudson in attendance. Onsite parking available. To enquire on any artworks, phone 07 3254 2297 or email admin@mitchellfineartgallery.com. The gallery can be followed on Facebook and Instagram and to view the exhibition online visit Mitchell Fine Art gallery.